Time is short...the boys have summer camp in the mornings in July, but it's all me and twin three year olds every afternoon. In August, our mother's helper will be back to help a bit(she's away this month), but there's no camp and no preschool in August...just me, filling up the play time as best I can. That means there's very little time for blog posts, no time for, say, complicated cooking or vacuuming up the copious amounts of dog fluff (honestly, it could be a new breed of dog!) on the floors. Yes. Even in summer here, we wear sweaters to bed with some frequency. With the windows open, it can get chilly at night, and both boys throw off their covers with some frequency. In an effort to get more sleep by helping them sleep through the night occasionally, I came up with these. This starts with either felted wool sweaters (from the thrift store) or cashmere ones that I bought to make into wool soakers or longies. (Wool is very absorbent and ideal for cloth diaper covers; it is what my boys have been wearing at night for most of their lives.) My mom helped out by making the first soakers and wool pants when the boys were born. 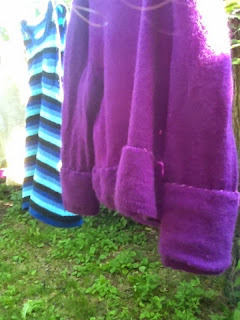 Some of the soakers are handknits but most are made from felted, repurposed sweaters. The wool pants, (also called longies) worn over their clothes, were great for winter time warmth when going outside and a lot easier than getting a couple of infants into snow suits. 2) When it is really cold, in the winter, we wear long sleeve sleepy sweaters. I repurpose felted adult sweaters or cashmere ones by hemming up the bottoms and sleeves so they fit my (still pretty small) three year olds. 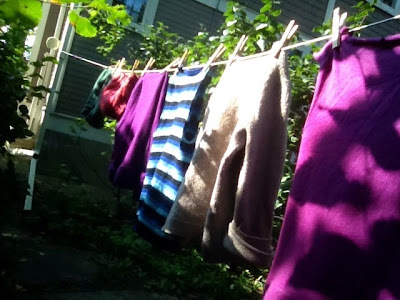 Recently, the purple cashmere sleeveless sleepy sweater was deemed the "ballet sweater." Leo, the older twin, is a great fan of dancing. He particularly enjoys twirling and stomping in his sleepy sweater before bed. 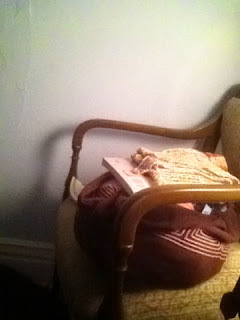 I began to get worried because this particular sleepy sweater was looking a bit ragged. When would I fix it and where would I find another perfect purple (CASHMERE!|) sleepy sweater? I had a very lucky helper. 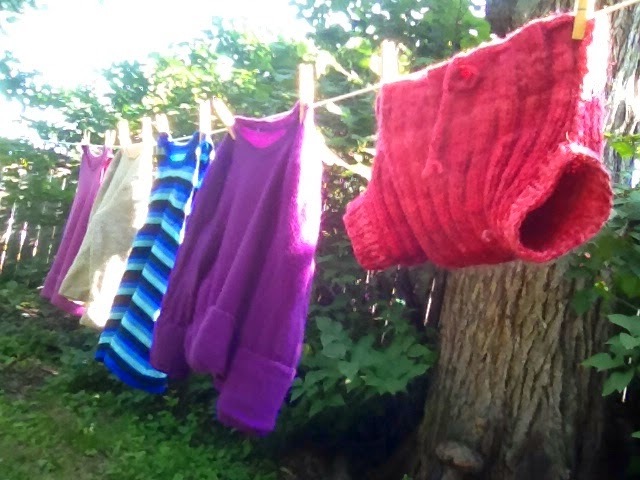 My friend Rachel, who owns Wolseley Wardrobe, a local consignment shop, kept her eye out for the perfect sweater. The stars aligned and we just landed a second, long sleeved cashmere purple BALLET sleepy sweater. Hurray! I get enormous pleasure out of seeing my guys cozy and ready for sleep, outfitted in woollies made or repurposed just for them. It is time well-spent because sometimes, just sometimes, I get to sleep 5-6 hours in a row when they both are warm and comfy enough to sleep through the night at the same time. I took advantage of a sunny morning to air these out and I wanted to share it with you. Hope you can imagine the twin ballet dancers twirling here. PS: I am wondering if the blog is something I should keep doing? If you are reading, why do you read? Are you a longtime reader? Would you like me to post something different? I just read this article and wonder if I've missed the boat on blogging. Should I have made mine into something money making? Is it time to let it go completely, as I cannot update it weekly anymore? I have finally found summer. Here. In Winnipeg. A couple of days ago, we could even shut our tap off and it isn't dripping anymore. (yes, frozen pipes were still a concern until after Canada Day. Oy.) Even though I am thrilled to see flowers, greenery, heat, all of it...we're still very covered up here. You see, we've had torrential rains, massive flooding in the Province (but not in my basement, thank goodness...) and now--MOSQUITOES. One of my 3 year old boys (the smaller twin, for those who know us in person) has a terrible allergic sensitivity to the bites, which is not surprising, given that the Professor and I are both allergy-prone. Well, he has had three bad bites near his eyes since the beginning of June. Yucko. This requires lots of "loopy sleepy medicine"(kid Benadryl) as well as "sauce"(cortisone cream) in order to keep from having the yucky antibiotics, which he had the first time he got a bite. Anyhow, the boys wear long pants, socks, shoes, button down long sleeved shirts sprayed heavily with bug spray, and Tilley sun hats, also perfumed with bug spray...and even so, they get bitten on their hands, their wrists, their faces...it's bad. The city will start spraying tonight and to be honest, I am just grateful. It is terrible when you can't play in the sandbox, enjoy a slide, or try out your new tricycle because of bugs. Also, morning preschool ended...camp (mornings) doesn't start 'til Monday, and our mother's helper went away to visit her family. So, we are having 10 days without any childcare. In order to sell this to the boys as something fun and not an alarming sentence (which is what it sometimes seems to us--3 year old twins, without any help or breaks or anyone willing to watch both of them while they are awake but us...and oh, did I mention they still don't sleep through the night too often?! )...anyhow, I sold it as a "Holiday with Mommy." Every day, we tried to do something fun together and I tried to tire them out. OK, on to the good stuff. At night, when I should be sleeping, I was working on this. As one of my brothers would say, with a sort of mischievous smirk, a little sumpin sumpin. Here's a link to Sumpin, my latest knitting design. 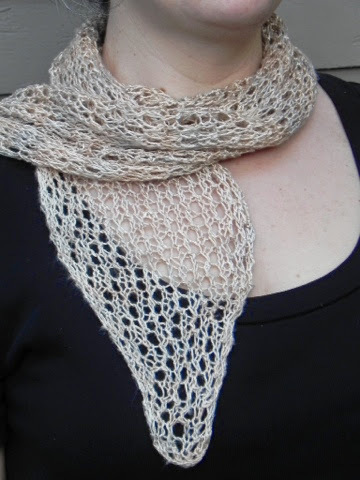 It's an easy cellular lace pattern, only 4 rows long, and absolutely lightweight and airy in something like silk. (This is Handmaiden Sea Silk, in Ivory) It's meant to dress up a t-shirt, or, in my case, to cover up stains! 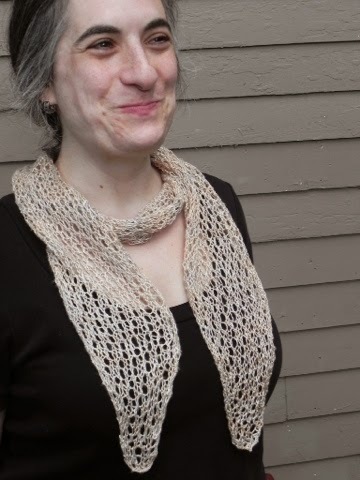 If I ever have to look nice again, I might want to wear/knit/own something like this. The Professor shot these photos of me outdoors one evening after the twins were finally asleep. It is light here until 10 or 11 pm this time of year and our twilight lasts a long time. However, the mosquitoes were also thinking that this scarf was "sumpin" and our photo shoot was actually very fast. This shot of me with my face all crinkled up and laughing was really like "Get on with it! Hurry up! Do you want to be eaten alive?!" 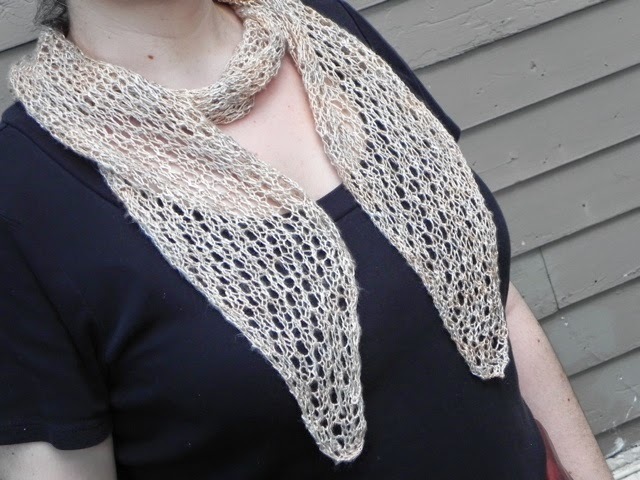 If you're curious about how I could possibly be designing or knitting now, well, I wonder that too. I shot a photo of a chair in my bedroom...stacked with my knitting bag, a copy of Knit Green so I could answer somebody's question, and this last project, this silk scarf. 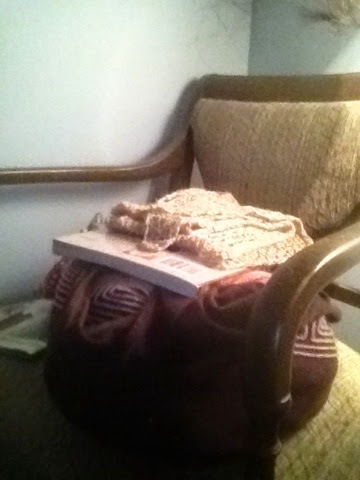 Knitting gets done in the tiny windows of space when I'm a passenger in a car, when the boys are drinking their milk before bed, and in the few minutes during naptime or before bed when I am trying to calm down and stealing sleep time to do it.